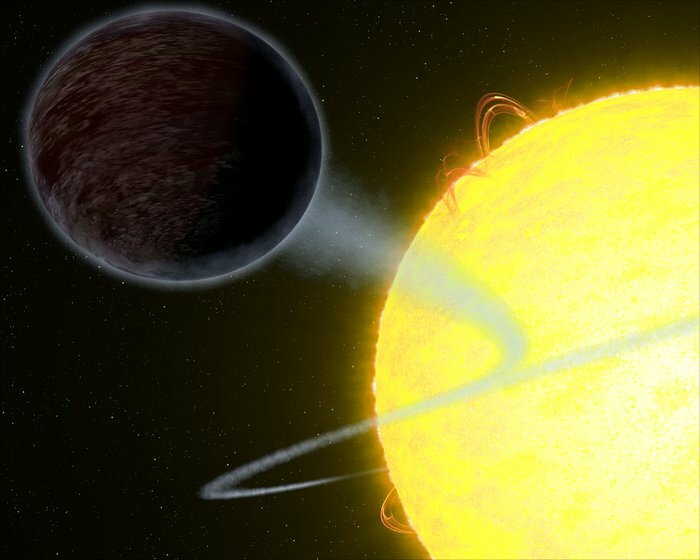 September 14, 2017 – Astronomers have discovered that the well-studied exoplanet WASP-12b reflects almost no light, making it appear essentially pitch black. This discovery sheds new light on the atmospheric composition of the planet and also refutes previous hypotheses about WASP-12b’s atmosphere. The results are also in stark contrast to observations of another similarly sized exoplanet. Using the Space Telescope Imaging Spectrograph (STIS) on the NASA/ESA Hubble Space Telescope, an international team led by astronomers at McGill University, Canada, and the University of Exeter, UK, have measured how much light the exoplanet WASP-12b reflects — its albedo — in order to learn more about the composition of its atmosphere. WASP-12b orbits the Sun-like star WASP-12A, about 1400 light-years away, and since its discovery in 2008 it has become one of the best studied exoplanets (opo1354, opo1015, opo1436, heic1524). With a radius almost twice that of Jupiter and a year of just over one Earth day, WASP-12b is categorised as a hot Jupiter. Because it is so close to its parent star, the gravitational pull of the star has stretched WASP-12b into an egg shape and raised the surface temperature of its daylight side to 2600 degrees Celsius. The high temperature is also the most likely explanation for WASP-12b’s low albedo. “There are other hot Jupiters that have been found to be remarkably black, but they are much cooler than WASP-12b. For those planets, it is suggested that things like clouds and alkali metals are the reason for the absorption of light, but those don’t work for WASP-12b because it is so incredibly hot,” explains Bell. The daylight side of WASP-12b is so hot that clouds cannot form and alkali metals are ionised. It is even hot enough to break up hydrogen molecules into atomic hydrogen which causes the atmosphere to act more like the atmosphere of a low-mass star than like a planetary atmosphere. This leads to the low albedo of the exoplanet. To measure the albedo of WASP-12b the scientists observed the exoplanet in October 2016 during an eclipse, when the planet was near full phase and passed behind its host star for a time. This is the best method to determine the albedo of an exoplanet, as it involves directly measuring the amount of light being reflected. However, this technique requires a precision ten times greater than traditional transit observations. Using Hubble’s Space Telescope Imaging Spectrograph the scientists were able to measure the albedo of WASP-12b at several different wavelengths. “After we measured the albedo we compared it to spectral models of previously suggested atmospheric models of WASP-12b”, explains Nikolay Nikolov (University of Exeter, UK), co-author of the study. “We found that the data match neither of the two currently proposed models.” The new data indicate that the WASP-12b atmosphere is composed of atomic hydrogen and helium. WASP-12b is only the second planet to have spectrally resolved albedo measurements, the first being HD 189733b, another hot Jupiter. The data gathered by Bell and his team allowed them to determine whether the planet reflects more light towards the blue or the red end of the spectrum. While the results for HD 189733b suggest that the exoplanet has a deep blue colour (heic1312), WASP-12b, on the other hand, is not reflecting light at any wavelength. WASP-12b does, however, emit light because of its high temperature, giving it a red hue similar to a hot glowing metal. “The fact that the first two exoplanets with measured spectral albedo exhibit significant differences demonstrates the importance of these types of spectral observations and highlights the great diversity among hot Jupiters,” concludes Bell. The Hubble Space Telescope is a project of international cooperation between ESA and NASA. Each of the five science instruments now operating on Hubble, including the Space Telescope Imaging Spectrograph, were designed and built by Ball Aerospace in Boulder, Colorado.